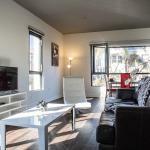 Furnished Suites in Gaslamp Quarter offers accommodation in San Diegoâ? 's vibrant Gaslamp Quarter. These apartments offer fully equipped kitchens complete with kitchenware. San Diego International Airport is 13 minutesâ?? drive away. The fully equipped kitchen in these air-conditioned apartments has a dishwasher an oven and a microwave as well as a coffee machine and a kettle. An outdoor dining area is also offered. Towels and bed linen are available. Facilities at Furnished Suites in Gaslamp Quarter include a fitness centre and a sun terrace. Balboa Park and the San Diego Zoo are 2 km away from the property. The San Diego Convention Center is just 1 km away from Furnished Suites in Gaslamp Quarter.